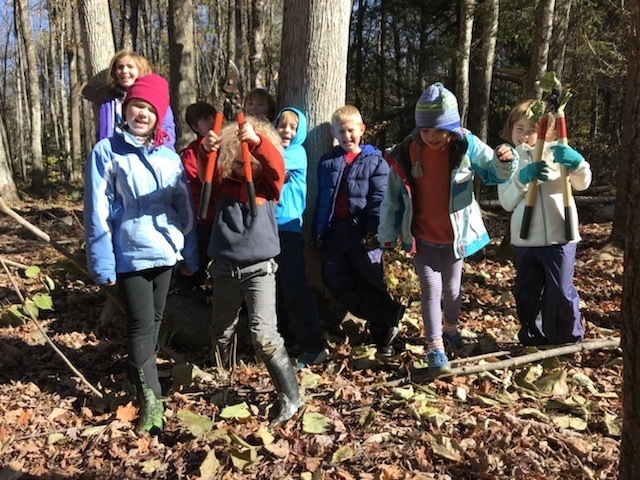 Last Friday in the forest classroom, our team of third graders cut back approximately 4,500 square feet of non-native Japanese Knotweed. This is a collaboration project with the Lyme Conservation Commission and has been a highlight of our forest learning so far this year. We used a measuring wheel to estimate length and width of our eradication area, calculated, and cut away! Our drying stations are spaced throughout the southeast section of the Big Rock Preserve and along the edge of the brook. We call that area, Waterfall. Over the course of the year we will learn more about this non-native invasive and persistently cut it back to prevent growth.